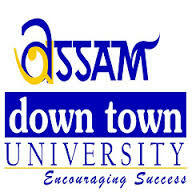 Assam Down Town University Distance Learning MBA 2019: Formed in the year 1997, The downtown Charity Trust emerged under the aegis of the downtown hospital ltd. It came into existence to uplift the underprivileged and deprived section of the society. The members of this trust not only includes doctors but also Educationists, Engineers, and other professionals. Along with other initiatives, the trust geared up to begin one of the largest educational campuses in the North-East region which aims to provide a myriad of professional programs available at reasonable fee structure. In the year 2004, the construction of the campus began to cater to the needs of students who want pursue a course of their choice. The first-ever course started by the college was BSc. Nursing Program in 2008 which was followed by Paramedical degree course in the year 2009. The Assam government granted the campus a university status in the year 2010 as per the provisions of the Assam Private University act 2010. In 2010 the Assam government granted the campus a University status as per the provisions of the Assam Private University act 2010. In the same year, the University got the recognition from A.I.C.T.E, New Delhi to successfully launch exams in Engineering, Pharmacy, and Management which further spread its wings to Hotel Management and Health departments. The University is barely 3 years old and is offering 50 programs with a batch of almost 2500 students from 10 Indian states and neighboring countries of Bhutan and Nepal. The University aims at providing quality education and is recognized by University Grants Commission, Indian Nursing Council(INC), All India Council for Technical Education(AICTE), Pharmacy Council of India(PCI) and Indian Association of Physiotherapy(IAP). The University will soon move on to NAAC for accreditation. The mission of the University is to expand its arena and improve the quality of the human resource of the nation by imparting quality education to everyone. With an increase in the business risk, a number of job opportunities There is a four-fold increase in the number of job opportunities generated with the globalization process which has not only brought the world closer but also increased the business risk. To function in such a dynamic environment which challenges the enterprise thoroughly and to steer through these challenges successfully for effective decision making, a formal management training becomes extremely important. To prepare a student with managerial responsibilities in the public or private sector, Assam Downtown University’s 2-year course in MBA is specially designed to prepare the students with a thoroughly designed framework so that they can be familiar with the demands of the market and thus manage a modern business or economic enterprise. Through a series of case studies, projects and industrial training, they are also prepared for the real world situations. The career graph is an escalating one with the graduating students getting managerial responsibilities and handle various functions as the Marketing, Finance Business Analyst, Human Resource manager, Administrative manager, Operations Manager, Branding and Advertisement manager, etc. An MBA graduate opens up a whole new world of opportunities and the scope of growth is extremely. Many MBA professionals grab the top slots in the Indian Corporate world and easily climb the ladder with efficiency. The field also provides entrepreneurship and cooperative organization options. MBA professionals also work for NGO’s and thus there is a wide gamut of job opportunities in this field. The degree in Management in today’s date is nothing less than an attractive proposition. The campus placement program of the institute provides attractive entries to the companies and guarantees a lucrative career path to experienced and fresh graduates. The market risk has increased and new initiatives have come up as well. This has, in turn, led to a widespread increase in the expectations of the employers in the corporate world who need expert professionally skilled managers to work in the tough and highly charged business environments. These managers are not only expected to survive but also thrive in the cut-throat competition. Globalization has brought the world together and made it a small and accessible place but it also increased the overall challenges for an individual. The Integrated BBA-MBA programme from Assam Downtown University has been created to achieve this very purpose. The programme is aimed at creating market-ready managers who are experts in their area of specialization. It also aims to inculcate a spirit of entrepreneurship and responsibility so that the students of today can become leaders for tomorrow along with the wealth creators. The programme adds on to the decision-making capabilities of the students. It also contributes to a holistic learning process which develops an in-depth understanding of the business environment in the students. The modules under this are designed to aid the students for a better comprehension of the dynamics of management and hence prepare them completely to face the corporate world outside. The department is also going to collaborate with Global Impact Solutions which is primarily the Indian unit of an American consulting and training firm which works to provide joint programmes in leadership and skill training programs. A variety of new initiatives have been taken up by the management department for the academic year 2012 and for the holistic development of students. The management students are now given free laptops after enrolling in the university. The campus is fully WiFi enabled and ensures everyone gets broadband internet connectivity to facilitate the learning process. The integrated BBA- MBA programme offered by Assam down town University focuses on preparing a student to walk on the path of progression and make a professionally rewarding as well as financially lucrative career for himself/herself. The benefits of this programme will be reflected in the student’s life as soon as he/she completes the course and ventures into the market to perform and test his/her mantle. The course structure is professionally and carefully designed by experienced faculty to have an in-depth understanding of the market demands and hence the topics are industry relevant, catering to the needs of the employers. The students can attain a thorough training in various domains of management including Marketing, Human Resource, Finance, Banking, Operations etc. The course is of four-year duration and any desiring candidate who has graduated from school under the 10+2 scheme of any stream be it Arts, Commerce or Science can enroll for the programme with Assam Down Town University either directly or through EduKart which will provide free counseling for hassle-free enrollment process.